The final exhibition in a series celebrating contemporary art, architecture and science opens at 48 Gordon Square on Friday 10 July. The UCL-owned but disused space has been transformed into a flourishing base for seminars, artists' workshops and exhibitions this summer. The series of events has been organised by UCL Museums and Collections with the support of UCL Estates and Facilities Division. 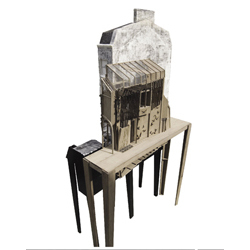 This exhibition - '[UN] Representative House' - features the work of current and former students of the UCL Bartlett School of Architecture. It is curated by Mobile Studio - Bartlett tutors Chee Kit Lai and Max Dewdney - and also includes work by artists and architects from outside UCL. The exhibition at 48 Gordon Square is free and open from 12pm to 6pm from 10 July to 16 July. Images: right, Luke Jones's 'Citizens Advice Bureau'; left, Ruth Silver's 'Dust Hat'.